Chancellor Ray Wallace with the junior and senior recipients of the 2019 Chancellor’s Medallion Scholarship. NEW ALBANY, Ind. 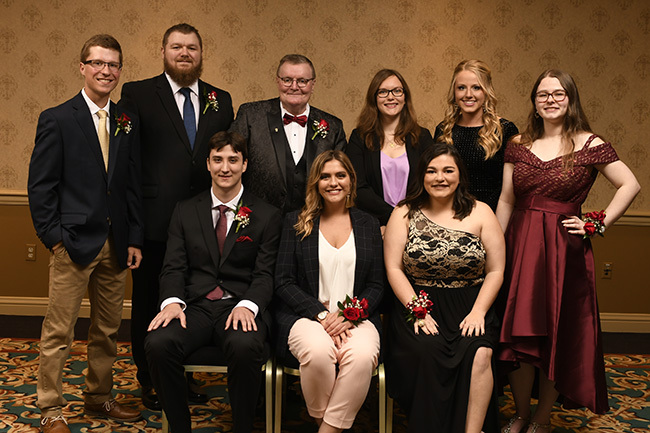 – Approximately 500 people attended the 2019 IU Southeast Chancellor’s Medallion Dinner, which brought in $145,000 from donations, ticket sales, sponsorships and a live auction. Enthusiastic bidders raised $24,000 in the live auction and additional gifts. The auction featured items like a trip to Harrah’s Las Vegas Resort, a getaway vacation, a bourbon tasting and tickets to “Hamilton” the musical. In total, the auction raised enough to fully fund four $6,000 Chancellor’s Medallion scholarships for IU Southeast students. Jim Hesselman, dean of the IU Southeast School of Arts & Letters, emceed the event on Saturday, April 6, at Horseshoe Southern Indiana and welcomed speakers such as Indiana University Executive Vice President for University Academic Affairs John Applegate, who spoke about the importance of supporting scholarships at regional campuses like IU Southeast. Chancellor Ray Wallace delivered the keynote address at the dinner. In his remarks, Wallace said IU Southeast is all about giving back to the community it serves and being part of this region’s economic and cultural enhancement. He also highlighted faculty and student achievements and new programs and partnerships throughout the past year. This year’s Chancellor’s Medallion community award winners are Wendy Dant Chesser, president and CEO of One Southern Indiana, Jerry K. Finn, executive director of the Horseshoe Foundation of Floyd County and Alice Phillips Miles, president of Friends of the Town Clock Church. In addition to the community award winners, the dinner recognized eight Chancellor’s Medallion scholarship recipients – four juniors and four seniors – for their academic achievement and leadership potential.